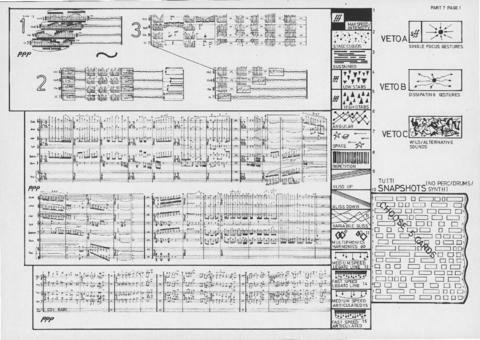 Item is a complete conductor's score for part 7 of Nasca Lines, in standard notation and graphic notation. The conductor uses this score in conjunction with flashcards that indicate different improvisational styles; these flashcards are no longer part of Upstream's Music Score Library. This section of the composition revisits material from parts 2, 4, and 6.